Posted on 06/18/2018 by Mark Engleson	in Live Review and tagged alt-country, Americana, Black Cat, blues, folk, Oklahoma, Parker Millsap, roots, singer-songwriter. 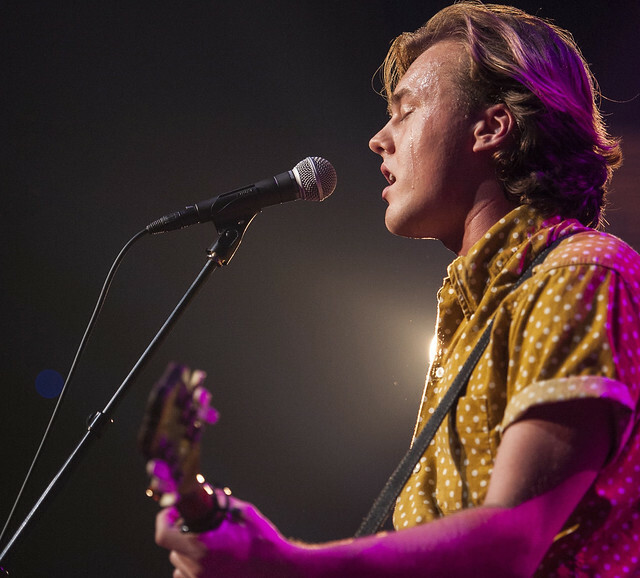 Babyfaced and blessed with movie-star good looks, small-town Oklahoma boy Parker Millsap played to a diverse crowd at the Black Cat on Wednesday evening. Twenty-four-year-old Parker’s style — blending folk, country, blues, Americana, and rock — appeals to a wide variety of fans: twentysomethings hip to hot new artists, people in their 30s and 40s who read the roots music journal No Depression, and older southern rock fans. At just $15 a ticket, parents could afford to bring their kids, and at the opposite end of the spectrum there was at least a handful of seniors in attendance. The mixed crowd gave the venue a fun, laidback atmosphere with plenty of fans dancing and definitely enjoying their rock music but keeping it pretty chill. Parker is currently touring behind the album Other Arrangements, released in May. On prior albums, Parker would include classic gospel songs, reflecting the influence of his Pentestocal upbringing (he has left the Church), and blues; Parker once said that he saw the only difference between the two as being that gospel is about God and the blues is about a woman or the devil. Other Arrangements, however, consists entirely of original, self-penned songs. In another departure from his previous, mostly acoustic albums, Other Arrangements is entirely electric. Parker’s performance at the Black Cat reflected this change, and the show was almost completely electric. He was accompanied by on bass by Mike Rose, who he’s played with since high school, and on fiddle by Dan Foulks, who cuts a striking figure with his long, bushy beard and sunglasses. Singer-songwriter and pianist Jillette Johnson opened for Parker. Two moments stood out from Jillette’s performance. In the first, a local transgender woman sang on her “Cameron,” about a young transgender girl. In the second, before “Other Brother,” Jillette spoke about not seeing one of her brothers for 20 years, and it was enigmatic why — whether he was simply estranged or he had passed. Parker had been playing for an hour when I asked my friend Paul the time. Paul told me it was 10:30, and opined that it would be a fairly early evening. He suggested that Parker would play until 10:45pm, do his encore, and the night would be over by 11pm. By the time Parker finished with his encore, it was 11:30pm — close to midnight by the time I made it home to Arlington. Parker played the entirety of Other Arrangements, including “Fine Line” and the title track. He played “Truck Stop Gospel,” the song that propelled him to widespread notice in 2014. He played a solo acoustic number and an acoustic number accompanied by Jillette Johnson. With only his fiddle player, Parker played “Jealous Son.” Parker played one cover, “Hesitation Blues,” by Charlie Poole & The Carolina Ramblers. Hopefully, Parker will play long nights of music for many, many years to come!